Hi, everyone! Today's post is all about landscapes and nature; it has proven to be my favorite out of all of them!! Card two featured something that I really wanted to try but just couldn't figure out: Galaxy or nighttime scenes!! (Cue in a really loud WOOHOO! here. Thanks.). Not only am I thrilled with how this turned out, this became my favorite of the bunch. Can't wait to try this one again!!! 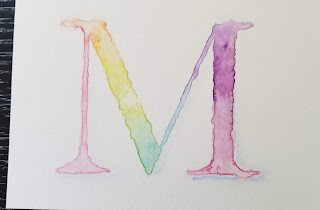 Hi, everyone; Marie here (again) but with today's Simply Watercolor projects! I am glad that Kristina brought up typography (lettering) because this was an area I was definitely lacking in. My handwriting is not all that great and it can be improved upon. Thankfully, watercoloring helps in this regard! Card one used the same technique to imprint an image onto watercolor paper but used a wet-on-wet technique for the color itself. I liked how this came out. 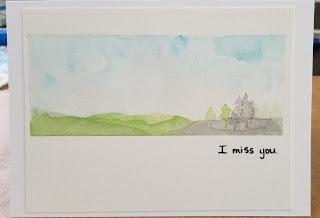 Card three was one of the simplest to make and it took the least amount of time; it has a bit of an airbrushed quality to it and I am very pleased with how it turned out. 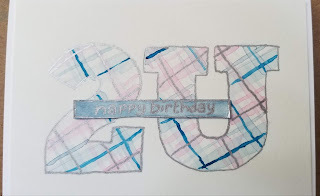 Card four included using almost all of the colors in my palette but I would definitely change it up so that the letters aren't as large or that I would include some sort of image with it. That said, I still think it's good to know for the future. Today's Adventure in Watercoloring: Cuddly Critters! Hi, everyone. 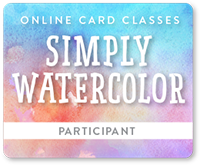 Marie here - really early because her internet was down last night - to show all y'all yesterday's Simply Watercolor products! 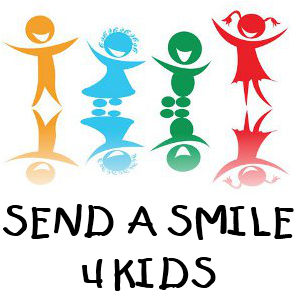 I'm really looking forward to today's lesson, which should be popping up soon. 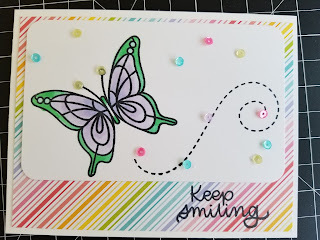 Had to quickly make a card for Simon Says Stamp's Wednesday Challenge!! This week, it's all about FUN IN THE SUN (even though I tend to turn LobsterRed(tm) during the summer)!! Yay for sunshine, rainbows, and, in my case, FLAMINGOS. I mean, c'mon. Flamingos (or flamingoes; both are acceptable spellings of the same awesome pink bird) and they should be celebrated. Why not now? Anywho, the majority of the products used came from SSS' July card kit and I thought the kit was perfect for this challenge. The only holdout was SSS hybrid ink in Hollyhock.